Join us for a guided bicycle ride on the East Coast Greenway along the Hudson River waterfront in New Jersey and New York, Sunday, Oct. 2 at 9 a.m. 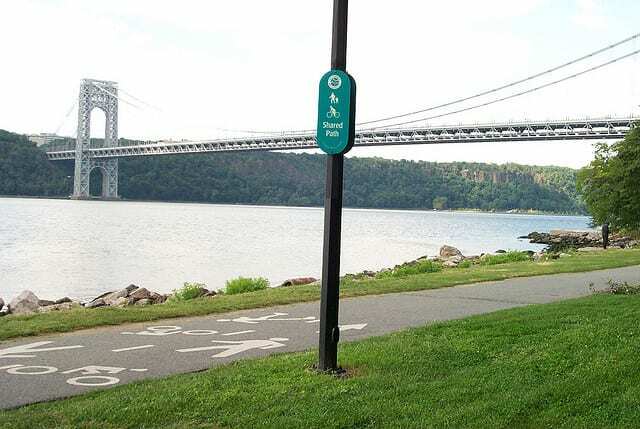 This 25-mile bike ride (easy-going pace of 9-10 mph) will travel along greenways (and a short on-road stretch), enjoying newly completed segments of the Hudson River Waterfront Walkway. At the Hoboken/14 Street dock, we will take the New York Waterway ferry to Manhattan, then return north along the Hudson River Greenway to and over the George Washington Bridge. We’ll enjoy lunch at beautiful West Harlem Piers Park, just opposite Fairway Market where food and drinks can be bought. We will return to Fort Lee Park at about 2 pm. Cue sheets provided. Bring snacks and water, wear helmet. Rain or shine. Start and end at Fort Lee Historic Park, Fort Lee NJ. 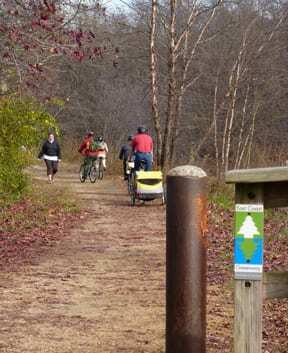 June 4 is National Trails Day, and the Lawrence-Hopewell Trail is marking the day in two ways, one for walkers and one for bicyclists. The first option is an approximately three-mile walk from the Mercer Equestrian Center across Rosedale Park to the Hunt House in Mercer Meadows and back. The second is an approximately 12-mile group bike ride from the Brearley House off of Princeton Pike in Lawrenceville to the Hunt House and back with perhaps a quick jaunt a little further down the trail to check out the connection to the D&R Canal and the East Coast Greenway. In each case, a representative from the Lawrence-Hopewell Trail will be your guide. Both the ride and the walk are free and will start at 9 a.m., rain or shine. Just rendezvous at the starting points. Both areas have parking available. The Lawrence-Hopewell Trail still has some missing links, but once finished (the goal is 2012), it will create a 20-mile loop from Lawrence to Hopewell and back with Bristol Myers Squibb and Educational Testing Service as anchors. 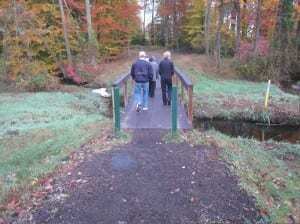 A critical, long-planned piece of the future East Coast Greenway is in danger of getting cut from NJDOT’s project list. Please join the East Coast Greenway Alliance to voice your support for keeping the 2.5-mile Route 7 Improvement Project alive in New Jersey! NJDOT is recommending that the 2.5-mile Route 7 improvement project, in Jersey City and Kearny, be deleted from its Study & Development Program. We are asking all of our supporters to voice their approval for keeping this project alive. NJDOT will meet on May 18th to make a final decision on this project. Please email (to aludwig@njtpa.org) and/or mail a letter of support for this project. We need to show public support for bicycle & pedestrian infrastructure. If we don’t give people choices and build alternative infrastructure our options for transportation will always be limited and our policies will continue to lead to increased congestion, decreased safety and a less-healthy lifestyle. Thanks for your support! I am writing you in regards to the recommendation made by NJDOT to remove the above mentioned project from the Study and Development Program. I feel that the 2.5-mile Route 7 project is a vital corridor and connection for the future route of the East Coast Greenway. I understand the many challenges and that significant costs are associated with this project but feel the benefits to the general public will outweigh the challenges and justify the investment. The East Coast Greenway is a developing safe and accessible bicycle & pedestrian corridor which stretches from Maine to Florida. Currently 26% of the East Coast Greenway exists as traffic free trails. 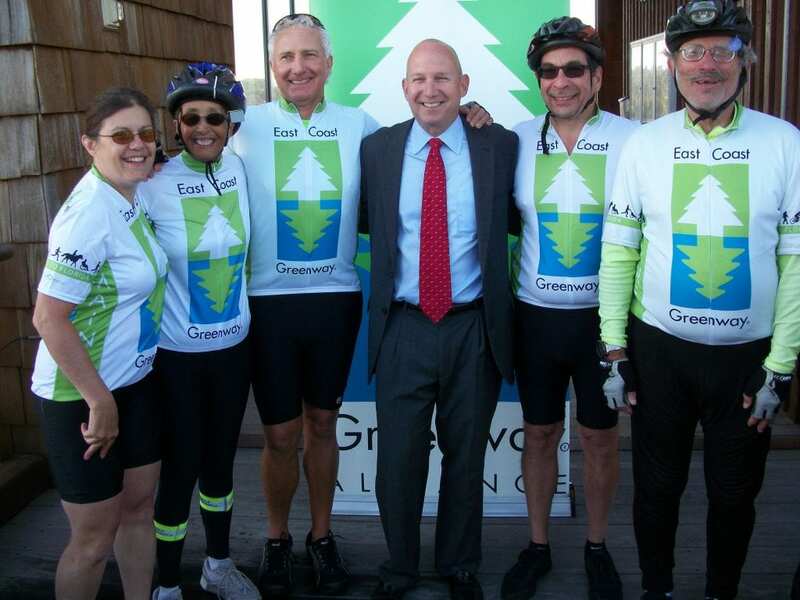 We have worked very closely with NJDOT over the years and their commitment has had the direct result in making New Jersey a leader amongst states in the development of the East Coast Greenway. Currently 53% of the ECG in New Jersey exists as traffic free trails. The Newark to Jersey City corridor is a critical connection for the East Coast Greenway and also for local non-motorized users who wish to travel between those cities, New Jersey’s two largest. On its eastern terminus, the completed safe and accessible bicycle & pedestrian corridor along Route 7 will enable users to cross the new Wittpenn Bridge being constructed over the Hackensack River and enable users to continue east into Jersey City and other populated towns and cities along the Hudson River in New Jersey. On its western terminus the Route 7 project will connect to the Newark Industrial Track which will eventually provide a safe bicycle & pedestrian connection to Newark and many other populated regions in New Jersey. The Route 7 project is a vital link which makes all of these connections possible. Without the Route 7 link, these connections become even less feasible and more costly. For all the aforementioned reasons I urge that the Route 7 corridor project not be removed from the Study & Development Program. If, ultimately, NJDOT decides to cut this project, we urge the agency to put more resources into assuring the safety and accessibility of the current East Coast Greenway route. May 7 brings the 27th annual Farmlands Flat Tour (yes, flat! 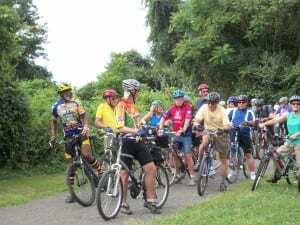 ), organized by the Central Jersey Bicycle Club. Routes range from 15 to 100 miles and depart from Brookdale Community College in Lincroft, off exit 109 on the Parkway. Register by April 28 if you want the T-shirt. If you’re missing (or are opting out) of Bike New York’s Five Boro Tour on May 1, there’s what we’ll call Tour de Manhattan, sponsored by the East Coast Greenway, on May 14. This is a 32-mile ride around the perimeter of Manhattan, starting at 10 a.m. from the East River Greenway and 61st Street (just south of the 61st St. Dog Run at the bottom of the ramp). The ride will be at a 10-12 mph pace and include the 13 miles of the Hudson River Greenway from Northern Manhattan all the way down to Battery Park. 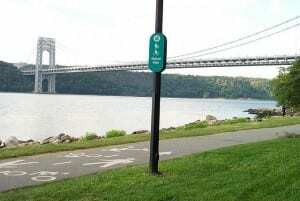 It also will highlight some of the gaps on the East River Greenway. The ride will finish at Glick Park at 37th Street around 2 PM. Or head to Pennsylvania the same day for the Route 113 Heritage Corridor Ride (the revamped, rebranded River to River Ride). Routes through through Bucks and Montgomery counties range from 10 to 65 miles. Starting point is Souderton, PA, west of Doylestown. A day later, it’s Tour de Montclair (and that’s its real name). The ninth edition of this annual ride starts at 9 a.m. on Sunday May 15 in Essex County’s Brookdale Park. 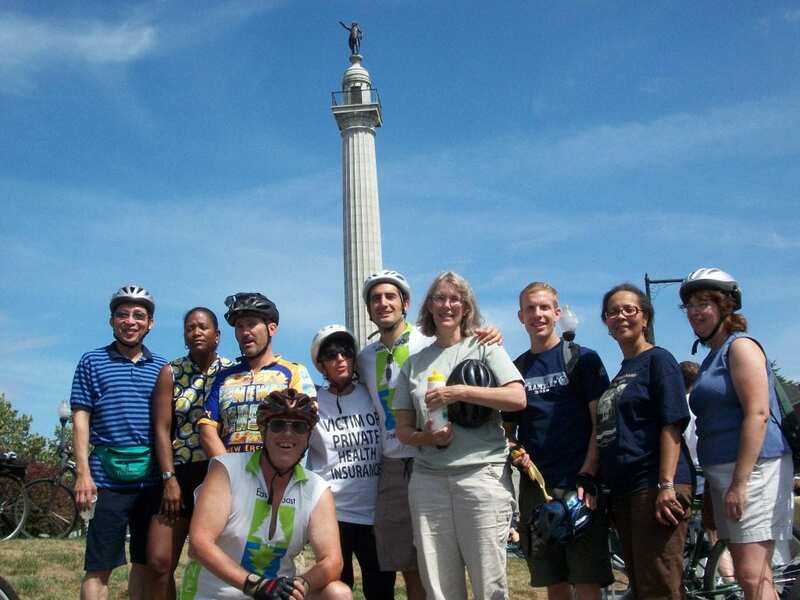 Finally, tour historic Trenton with the Trenton Cycling Revolution on May 21. The leisurely 15-mile police-escorted ride through Trenton’s historic streets and sights, diverse neighborhoods and community gardens leaves Cadwalader Park at 9 a.m. Hats off to all 50 or so people who took part in TR2NB40 — a 40-mile walk from Trenton to New Brunswick along the D&R Canal on Saturday. Not all walked the entire route, but it sounds like everyone had a good time. We received two reports, one from WWBPA trustee Michael Ogg and another from WWBPA member Loretta Rice. Michael did a five-mile roll, as he called it, in is battery-powered wheelchair from the D&R bridge bridge over Route 1 in Lawrence to Alexander Road. “It was fun talking with others and learning about other walks such as The Great Saunter on May 7, a walk round Manhattan. The first section from the footbridge to Port Mercer can be a bit difficult in a wheelchair: the center of the path is grassy, which today was very muddy, and the gravel and sandy strips on either side aren’t quite wide enough for a wheelchair so one drive wheel was always on soft ground. But Port Mercer still appeared quite quickly. Here was the only big problem: there’s a guard rail on the bend but cars are always hitting it and it was impossible to get back onto the towpath (I’ve written to the Park Superintendent about this). I had to go about 600 yards down Quaker Rd which was not fun as there’s no shoulder and cars go quite fast. Two brave walkers accompanied me. At the bend it was sort of possible to get back onto the towpath. I wouldn’t have done it by myself as the short stretch was dangerously steep but two more walkers made sure I didn’t tip backward. “The day started off well, at 10 a.m. when I left my house to pick up walkers at the Princeton Junction train station, and it was clear that the weather was going to be perfect for walking and the train was on time. I picked up four walkers who came in from various points on the Northeast Corridor line and drove to Turning Basin/Alexander to join the Freewalkers on the 40 mile D&R walk. Those walkers who started in Trenton were at Turning Basin in good time, most of them arriving before 11 a.m. A few walkers broke off their walk at this point. After a 15-minute break for water and snacks provided by cheerful volunteers from the East Coast Greenway, I joined the group and started walking. This was only my second time crossing at Alexander since the crossing lights were installed and when I happily activated them, one of the walkers commented, “Hey, they actually work!” as cars stopped and allowed us to cross. As someone who drives across this bridge every day on the way to work, it’s a very different perspective from a pedestrian view; when walking, it’s difficult to tell if the lights have actually begun to flash. I was surprised by this as when viewed from inside a car, the lights are amazingly bright. Walking on the canal trails is always such a joy, the scenery is beautiful and the clay path makes walking easy on the joints, the only minor negative on this day being the previous day and night of rain created quite a few puddles to be navigated on the sections between Alexander and Kingston. Most walkers kept up a pace between 3 and 4 miles an hour, a comfortable pace that made it easy to carry on a conversation. The not-quite-six miles to Kingston flew by as I chatted with various walkers along the way. 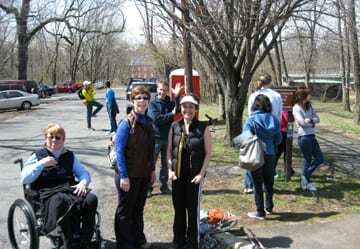 On reaching Kingston, the walkers took a break for lunch at the parking lot near the Lock Keeper’s house. The East Coast Greenway volunteers again provided snacks, water and information on the Greenway. Walkers shared stories, ate their lunches, changed socks, a few tended to a blister or two and others sat on the stone wall soaking up the sun. I walked the next section to Rocky Hill for a total of 7.5 miles and broke off my walk there; I am recuperating from a foot injury and am easing myself back into to long-distance walking and got a ride to back to the Turning Basin parking lot. Yes, there are more walks planned. 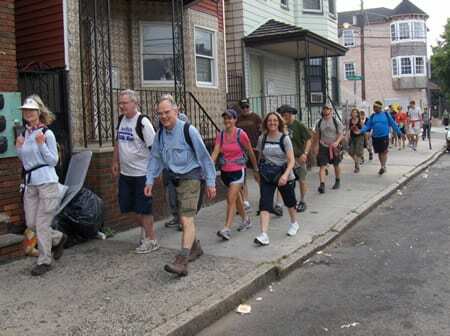 This walk and others are organized by Freewalkers, who are challenging all to walk 100 miles across New Jersey using the East Coast Greenway. Gov. Christie’s proposed NJDOT transportation capital program for the fiscal year that begins in July includes $8.7 million to replace the bridge deck over the railroad tracks on Schalks Crossing Road, heading north in Plainsboro toward South Brunswick. Roadway improvements would include milling and resurfacing the existing roadway approaches for tie-ins to the bridge. The state’s capital program also includes funds for a New Brunswick Bikeway (which would link the various Rutgers campuses), various intersection treatments, and grade-separation crossings at locations in Middlesex and Union counties that intersect with the state highway system and will allow for a safe crossing along the East Coast Greenway route. We’re also intrigued by a Lawrence Township project that is receiving $30,000 as part of an effort to turn a stretch of Business U.S. 1 into a pedestrian-friendly roadway that slows speeds and promotes business development. It’s described this way: “The roadway cross section (traveled way) will be reduced to provide 11-foot travel lanes, on-street parking along the northbound side of Route 1B, pedestrian “bulb-outs,” crosswalk enhancements and a 16-foot-wide center median, which can be planted with suitable low ground cover, flowers, etc.” The state’s five-year transportation capital plan calls for $4.3 million in the fiscal year that begins in July 2012 to cover construction costs. Sounds like a Complete Street! Other projects include $3.5 million for right-of-way acquisitions as part of proposed safety improvements along Route 1 between Nassau Park and I-95. The five-year plan calls for spending nearly $9 million two years later for the actual construction. You can read more about these projects here. Here’s a challenge for those who love to walk: Walk the length of the East Coast Greenway in New Jersey — 100 miles — this year. The challenge comes from Freewalkers.org, the group that started last year with the NJ2NY50 walk, 50 miles from Metropark to Penn Station. 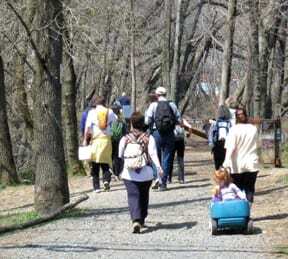 Participants can walk the Greenway at any time during the year or take part in some or all of the three walks the group is organizing: the Great Canal Walk (Trenton to New Brunswick along the D&R) on April 9; the Tween Walk (New Brunswick to Metropark) on April 16; and The Big Walk (Metropark to New York City) on May 21. 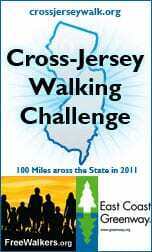 More information and registration is at Cross-Jersey Walk. Cycling shoppers can look forward to Quaker Bridge Mall’s expansion and renovation, which will include improved bicycle and pedestrian access to the mall. The plan is to provide trail links to both the Avalon Run community southeast of the mall and to Yorkshire Village on the other side of Route 1, behind Mercer Mall, as well as a path along the southern portion of the mall’s loop road. A macadam path is to be added from Grover’s Mill Rd on the southeast side of the property to the Route 1 access bridge on the southwest corner of the parcel. The path will continue over Route 1 via a new bike/pedestrian lane to be added to the bridge that now connects the mall to Route 1 near Patio World Fireplace & Hearth and Toys R Us. Lawrence Township is working with the Yorkshire Village homeowner’s association to extend that path to Canal View Drive. From that point it is relatively easy to access the D&R Canal towpath (and then the Lawrence-Hopewell Trail and the East Coast Greenway) via the existing residential street and path leading to the neighborhood’s community center. The size and shape of the new path over Route 1 is still to be determined, as is the timeline for the whole project. 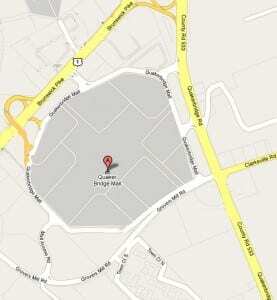 The mall’s expansion, which was originally expected to be completed by now, has been delayed by the recession. The mall’s legal counsel was recently before the Lawrence Township planning board seeking a 20-year extension in their overall plan. The township granted an eight-year extension and underscored the importance of bike/pedestrian access over Route 1. The West Windsor Bicycle and Pedestrian Alliance supports Lawrence’s efforts to improve bicycle and pedestrian access over Route 1, which will improve connections for West Windsor residents as well. 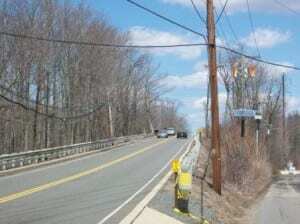 The current bridge over Route 1 on Quaker Bridge Road isn’t suitable for bicyclists and pedestrians. The WWBPA also wants to see the off-road path along Clarksville Road that is in West Windsor’s master plan become reality at some point and is pleased to see that a multi-use trail along Clarksville is part of the new apartment complex now under construction near the railroad bridge. Our thanks to Lawrence Township’s bicycle and pedestrian advocacy group, the Sustainable Transportation Committee, for this report. Join the Pennsylvania branch of the East Coast Greenway Alliance for a fundraising bike tour from Trenton to Philadelphia. Tickets are $50 and there is a registration limit of 40 riders. All proceeds go to the East Coast Greenway Alliance to help construct more of the trail from Maine to Florida. Pre-registered riders from central Jersey can join the group in Trenton (the train from Philly will arrive at 9:38 a.m.; find them in the lobby of the main entrance) and will need to make their own way home. Septa and the RiverLine in Camden are both options. For more information, go to Trenton to Philly ECG Ride. 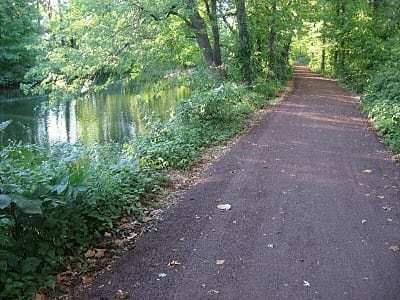 At some point this past summer, a portion of the Delaware and Raritan Canal Towpath was resurfaced and the width standardized using a crushed red shale aggregate. The installation of the new surface has been confirmed from Landing Lane in New Brunswick, all the way down to the Griggstown Causeway but could extend further south than that. The new surface is a real pleasure to ride on and is even stable enough for cyclists using narrow road tires. With the new smooth surface, riding the canal towpath can now be done at faster speeds and is wide enough for two riders to comfortably ride abreast of one another. Also, red shale is native to the Piedmont Region that the canal passes through so it looks natural and not out of place like some of the other materials used on the path in the past. 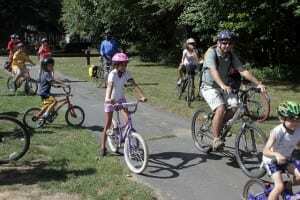 On a perfect day for a bike ride, 75 people came out on Saturday, August 14 to celebrate the completion of the missing segment of the D&R Canal towpath between Trenton and New Brunswick – representing New Jersey’s longest segment of the East Coast Greenway. Many members of the WWBPA rode, as did West Windsor Mayor Shing-Fu Hsueh and Council President Diane Ciccione as well as New Jersey Assemblywoman Grace Spencer. Lawrence Mayor Pam Mount was there for the start, and Congressman Rush Holt spoke (but didn’t ride), noting that he began championing this project when he first went to Washington 12 years ago. The 1.5 mile stretch of macadam belies the obstacles. Not only were there negotiations with Conrail but a number of other surprising obstacles came into play – such as issues with billboards. But all of that is now dust under the wheels. Riders took it slow, taking nearly an hour to ride the seven miles to reach the Battle Monument in Trenton. 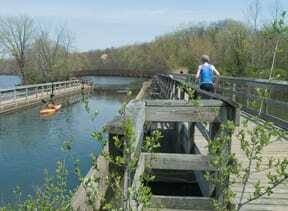 After a 40-minute rest break hosted by the Trenton Cycling Revolution, the group returned along the same seven-mile route. 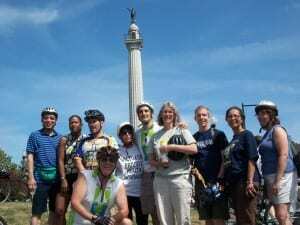 The ride was capped off with sandwiches, salads and sodas at the Brearley House in Lawrence Township, provided by the East Coast Greenway and New Jersey Bike and Walk Coalition. The WWBPA thanks Don Pillsbury from the Lawrence Sustainable Transportation Committee for this report. 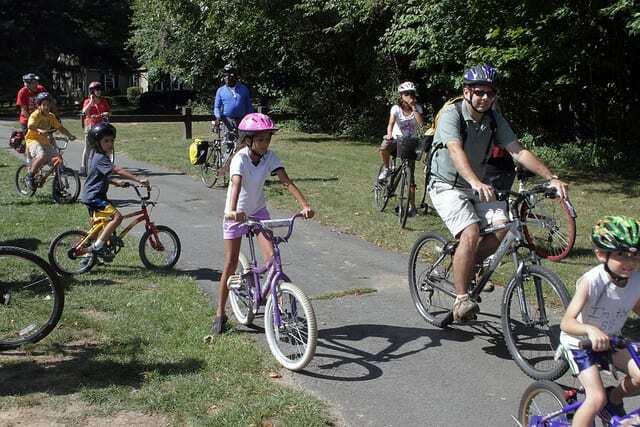 The WWBPA joins the East Coast Greenway, the New Jersey Bike and Walk Coalition, and the Trenton Cycling Revolution on Saturday August 14 for a 14-mile family-friendly ride on a newly constructed section of the D&R Canal/East Coast Greenway. The ride starts at 9:30 a.m. at the Brearly House in Lawrenceville along Princeton Pike/Route 206 (also a link to the Lawrence Hopewell Trail). Because the route is partially unpaved, hybrids or mountain bikes will work best. Elected officials and their staff are invited, so this is a great chance to show how popular bicycling is in the Garden State (ranked the eighth most bicycle-friendly state in the nation by the League of American Bicyclists) and to encourage them to support bicycle-friendly projects.